When uploading or downloads say 20 files, what is shown in the queue list are only the first 2 (the ones being transferred), but it doesn't show the rest of the files, or how many files were uploaded or still not uploaded so far. I don't know if I am missing an option to show all the list, or should this be submitted as a feature request? Does the queue you see look like this? This is the foreground transfer queue. Although this window appears to show two uploads/downloads happening at once, it actually only shows the progress of a single file transfer + the overall progress of all transfers in the foreground transfer queue. This is the default queue for uploads and downloads and can only process one download or upload at once. 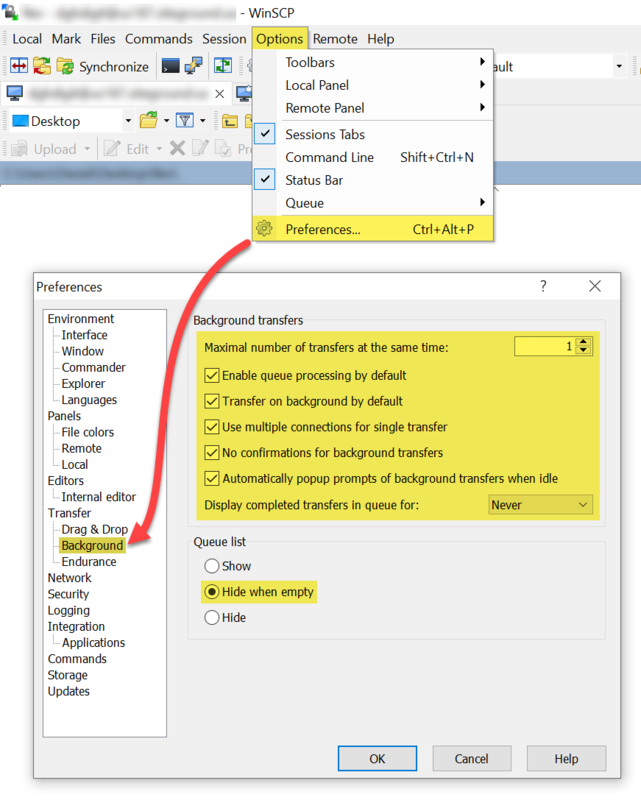 On the other hand, the background transfer queue places all pending transfers in their own pane at the bottom of the WinSCP window. All pending transfers in this queue are always visible. This queue can process one or multiple uploads/downloads at once, depending on the value you choose in Preferences. It sounds to me like you're using the foreground transfer queue. There is no way, in either the background or foreground queue, to only show two transfers and hide the pending ones, but the foreground transfer queue can definitely give the appearance that that is what it's doing as it shows two progress bars! I recommend trying these settings. Personally, I prefer to allow large downloads to finish one at a time but you may wish to use a larger number. Thanks, but I am talking about the Queue List that is always shown in the bottom the program, it just shows the files being transfered, and not the rest of the files waiting to be transferred in the same folder. I think we've just found a bug in 5.15! I'm able to reproduce what you're describing: if I add more than one upload or download to my background transfer queue simultaneously, only the first one is put in the queue. The total displayed also only increases by one, confirming that other downloads were not hidden, but simply not added to the queue. The workaround is to add each individual upload/download one at a time. Bulk adding seems to be failing with the latest update. This looks like a new problem. I've never seen this happen before. It's indeed currently not possible to show all the queued files. We will see, if more people ask for this. This does not look like the same issue reported by @wise_mike. Can you please start a new thread and post few screenshots documenting the problem? In WS_FTP or other ftp programs, mainly there is a "+" beside the uploaded folder or bulk of files to expand all the list of files/folders/subfolders being uploaded.. which is very helpful, as one can pause a particular one in the files/folders waiting to be uploaded, or even delete it from the queue.. etc.